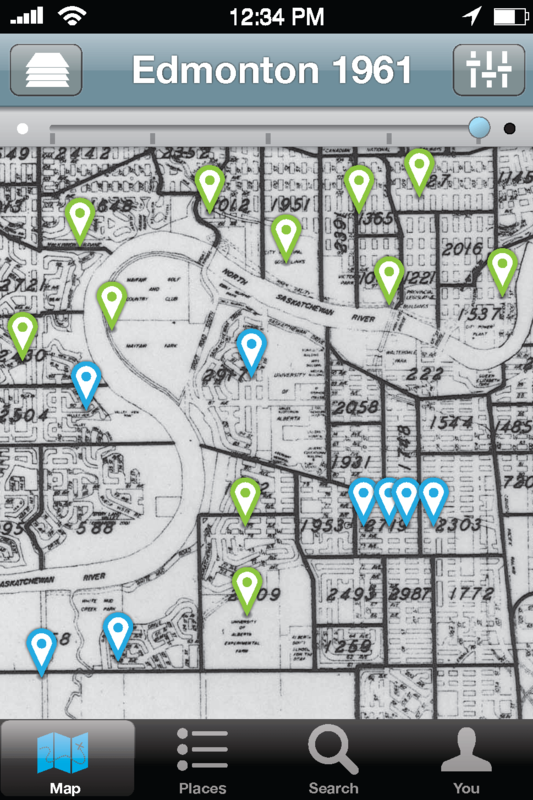 A proposal of an iPhone app with the main object to explore historical places and events in Edmonton. With this app people can walk in the urban environment using old maps, discovering and learning the history of the city. The historical maps available in the user location will be overlaid the current map. The point of interests will be shown on the screen based on the map chosen by the user, revealing the past of that location. A slider control lets the users switch back to the present, give them a grasp what is nearby in this days. By choosing a location, the app will show facts and pictures, where available. Using social networking, the user can see which of his friends visited that place in the past. Have fun and check in former times. Share your location and the historical information using Facebook and Twitter. Make comments and take pictures using built-in tools. Discover the past to make a better future. Audience: Edmontonians and potential tourists. Content: Historical Maps and facts.